As the owner of a consulting company, one of my favorite things to talk about is how to navigate from, “I need a team” to, “I just hired my dream candidate” to, “Let’s get this relationship built” to, “Time to get some work started!” to, “Let’s keep this machine running well.” I love helping people build their perfect project team. That’s because, in professional services, your people are your product, meaning your people are also your profit. Building the right team and retaining top talent are two of the most important aspects of running a profitable consulting company. After years of experience building powerhouse teams, this is the process I have discovered to be the most successful at finding the right players and setting them up for success. In an industry where your people are your product, there is nothing more important than having the strongest team possible. I always put the emphasis on the word “possible” because we would all love to hire the best of the best, but we don’t always have the financial or creative means to do so. We have to focus on hiring the best we can afford at the time, and sometimes building the perfect roster can be more difficult than it seems. The market is flooded with qualified (and unqualified) candidates, and finding the right one can feel a lot like finding a needle in a haystack. So instead of the traditional method of one-on-one interviews with a checklist, I have found success in building my teams by looking beyond the resume. Anyone can copy and paste a job description, so focus on things like how they will fit into the company culture, how they will interact with your established team, if they understand your leadership model, and what motivates them. Take candidates out of their comfort zone with group interviews, have multiple team members interview them, ask for their track record or examples of previous work, and don’t be afraid to ask a lot of questions. A qualified candidate will be able to fit in well, articulate their skill sets, and clearly demonstrate the value they would bring to your company, even under pressure. I always advocate for focusing on three primary areas when hiring new staff. One is your interview process. It will evolve over time—you just need to have one. It doesn’t have to be great, but I do recommend you spend a little time thinking through it. A good interview process can save you time, money, and a lot of headaches. We have refined our interview process over the years and will continue to do so. Right now, we have a three-step interview process that is designed to narrow down the candidate pool at each step. An interviewee’s first interaction is with an administrative person, who conducts a short, 30-minute or less phone interview asking the interviewee a prescribed set of questions. These questions are designed to eliminate interviewees that have not done any research on our company or the job position. This step also establishes a cultural fit baseline through some fun and pointed questions. If the interviewee gets through the first step, they move on to a virtual/video interview (or in-office, pending location) with a technical team member. This step in the process tests the candidate’s technical knowledge and their ability to solve real problems with little time. It also involves another set of cultural questions. This process has taken 60 minutes in the past, and we continue to refine it with the intention of capping it at 45 minutes. The last step in the process, pending the candidate gets that far, is a face-to-face interview with me. In most cases, I have a pretty good idea as to who I am talking to and what a few of the team members think about the interviewee. It’s my job to determine a few things, including cultural fit, long-term expectations, and whether or not I can work with them day in and day out. Overall, this process has done very, very well for us. Interview questions are the second area you will want to focus on. You can search online for interview questions all day and find the same boring, overused questions. I tend to shake things up a bit and really find out who I’m talking to. In our interview process, we ask a lot of open-ended questions, the type of questions the interviewee doesn’t necessarily practice. We also ask the salary question first. This helps set the stage for the rest of the interview. In my experience, one of two things will happen: Either the interviewee has thought about it and has a number and some sort of justification or they are afraid to talk about it upfront. Personally, I prefer the interviewee that knows what they want and has at least put the time into understanding their justification. This is not to say they will get what they ask for, but just the awareness and preparedness is key for me. Also, by asking this question first, you will get a good understanding of their personality and whether or not they are even in the ballpark of what you have to offer. Why are you leaving your current company? What does it mean to be coachable? What does teamwork mean to you? What does that look like? Why do you think you want to work here? Are you familiar with the characters in Winnie the Pooh? Which character most likely depicts your attitude/nature? Last, but certainly not least, is interview scoring. I was introduced to interview scoring some time ago and think it can be the key to truly effective hiring. We try to measure everything that matters, including the quality and fit of potential new hires. For every new job opening, we create a decision model with categories and scores. I find this is the most efficient way of evaluating the things that matter when it comes to our culture. With each category comes questions which determine the interviewee’s score. I usually have a minimum of two current employees score each candidate, and we take the average of the internal scores. At the end of the day, we end up with numbers and not opinions, and it really creates a sense of community and communication among the current team. Once you’ve built your project team, it’s time to bring them together and get them established, grounded, and ready to rock-and-roll. Below are some tips to guarantee a well-prepared team. Consider onboarding as the foundation for a house: You can’t expect it to be sturdy and reliable if it doesn’t have a solid base. It’s the same for an employee: An untrained and poorly onboarded employee is being set up to let you down. For the smoothest onboarding process, offer a good amount of training on how your business operates internally (what tools you use, how you collaborate, what happens when someone needs help), set clear standards for the work environment (dress code, usual working hours, times when they should be focused on internal activities rather than billable client work), establish benchmarks for regular evaluation (I don’t believe in semi-annual or annual review—too much happens in between—and prefer a checkpoint at 30 days, 60 days, and 90 days, then every 90 days after that), keep the door for questions, and most importantly, be direct with expectations and have patience as they learn your ways. And always remember, you can’t reprimand someone for crossing a boundary that you never set. Have three checklists already created, one for each checkpoint. The 30-day checkpoint will look different than the 60, and the 60-day will look different from the 90-day. Make sure to show the new employee the checklist so they know what is expected of them. There are no right or wrong items to put on the checklist; it just needs to be visible and appropriate for the time period. By creating this checklist, you may also find that your process and information sharing needs a bit of work. That’s a good thing; that means this part of your process is evolving and maturing! The billable resources that compose a great amount of your team are the power behind the project. Without them, nothing would get done, but they can also take up a lot of time. Inevitably they will require some management and support, and that’s where your project manager steps in. I was responsible for managing projects before opening my own company, and I know that it is crucial your project manager is educated on the requirements of the project and the needs of the client. The project manager needs total visibility into resource and project progress and needs to feel in complete control. All project managers approve billable resource time and are accountable for having that time be submitted and approved on time. Each project manager has insight into invoicing and are accountable for ensuring accuracy and timeliness. All project managers also meet with leadership once a week, for no more than 60 minutes, where they have an open forum to talk about project issues and risks and ask for help solving project- or resource-related problems. Whether it be uniting your sales and project leaders, your IT and marketing leaders, or your marketing and sales leaders, integration of departments is a great way to ensure fluidity among team members and reduce the chance of errors caused by improper communication. When a team is integrated, not only does the team’s strength grow, but company culture expands as well. In order to accomplish this internally, we have daily checkpoint meetings at 8 a.m. where each team gives an update that consists of three things: First they let everyone know what they worked on yesterday, then what they plan to work on today, and finally if they have or know of any project-related issues. When I start to feel like these meetings are getting stale, or attention and focus are waning, I will put everyone into cross-functional pairs, and they will have to give each other’s updates for a week. If your average employee lifespan is six months, chances are morale around the office is not so great. The longer the employees stay with you, and the longer the team works together as a unit, the higher the quality of work. A huge part of retaining your talent is keeping them happy and motivated. A study by The University of Warwick found that happy employees are 12 percent more productive, and when your people are your profit, that 12 percent can make a huge difference. Here are a few ways I keep my teams engaged. For some reason, there is a stigma in the industry about project failure. The stigma has become so great, it’s like when someone is diagnosed with a fatal disease. Almost everyone knows it’s happening but refuses to talk about it because they either (a) don’t know how or (b) feel incredibly awkward doing so. But in order to avoid another failure, this behavior has to stop. 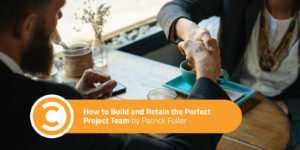 A project team can learn just as much, if not more, from failed projects. In fact, nearly 50 percent of unsuccessful projects are impacted by poor decision making, which means identifying and discussing these decisions is crucial to continued project success. Even the most powerful, experienced business leaders can fail to respond properly to the needs of their team, and this can be detrimental. A team member who feels ignored will become disengaged. Performance drops, and the likeliness of turnover increases. I try to remind myself that the problem is not the problem—meaning the issue they bring up is usually not the root cause but rather the pointy end that is poking them. Dig deeper until you feel you’ve found the real cause of the issue. Your staff might not love the deeper dive, but if you solve the root cause and prevent the issue from surfacing again, they’ll appreciate it. Plus, this process will help your staff understand how to re-think problems, and hopefully, they’ll actively look for the root cause of the issue next time. When it is clear that you care about the success and future of your employees, they work harder to prove they are worth a spot on your team. Offer to send them to a seminar or conference once a year, or just reimburse them for a certain budget for educational materials each quarter. Nothing makes a team more powerful than staying well-educated and motivated. To get the best bang for my buck, I may ask an employee to give a presentation on what they learned and (almost more importantly) how we can incorporate this new learning into our people, process, or tools. This holds the employee accountable for not only attending with intent but also the ability to retain the knowledge and understand how to apply it where it matters most: the company. Oftentimes, we can get so caught up in starting a project and managing all its tasks and deliverables that by the time the project comes to an end, the profit margin has taken a hit. Maybe a resource took longer than expected, or a mistake was made that slowed everything down, but the team was so busy trying to complete the project that they forgot to complete it with the most amount of profit possible. To encourage more awareness of profit margin, set a goal based on margin percentage on completion, and track your progress toward this goal from start to finish. Review this goal every week after time cards are submitted and approved, and provide a space for an open dialog around how the team could make adjustments if/when needed. Hiring, training, and maintaining the best team isn’t something you can set and forget. But I hope that if you use these practices, you’ll be able to build a happier and more productive team that fits your company’s needs. Let me know how you’ve recruited your own perfect project team in the comments below. Patrick Fuller is the founder and CEO of ForeIQ.